In this present era, designing bedroom has become quite popular. Anything which is designed by professionals looks different and creative. Bedroom is the foundation of the house, the most sacred and peaceful place to be. As we know, bedroom is a place to recline so it should be designed in such a way it should take away all the worries and stresses of our daily life. In other words “The bedroom should provide us with full comfort”. While designing a good bedroom, some functional elements as well as a esthetical elements are to be kept in mind which includes furniture, storage, color, decorative accessories etc. Layout is one of the most important things to keep in mind while designing a good bedroom. All you should do is to keep in mind where you are going to place the bed, dressers, wardrobe as well as TV. 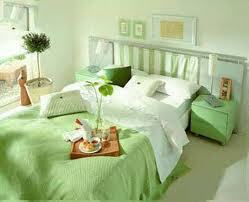 The layout plan of the bedroom will depend on the size as well as shape of the room. Next we talk about the lightening. Every one desires a cozy as well as relaxed ambience. Decorative lamp- shades placed beside the bed enhances the beauty of your room. You can also place some decorative bulbs, tube lights, chandeliers depending upon the size of your room. The lightening of the room should be placed in such a way that there is enough illumination in the different parts of the room during various requirements such as while dressing, taking out things from the wardrobe, drawers etc. Colors play an important role in bedroom design. Colors enhance the beauty of your room. A color helps in creating the right ambience as well as atmosphere in the room. Some of the very popular colors are mahogany, chocolate brown, pink with white, purple with pink. The colors of the room should be placed in such a manner that it should complement with other things of the room. Next we talk about furniture which is one of the most important things to be considered in mind. Decorative furniture adds charms to your room. Apart from design relaxation and comfort are also the two most important things to be kept in mind. Always select the bed by keeping in mind your requirements. Don’t go for too fancy designs. Instead, buy the one with high-quality. Dressers with mirrors are perfect. Designer dressers add style and variety to your room. You can buy your furniture from one of your trusted furniture stores. It is one of the most popular furniture stores which provides with high-quality as well as designer furniture. You can find anything and everything in this store. They have the best quality material including wood, metal and even rattan and bamboo furniture. The staff at this place is very supportive, therefore, you will have a great while buying the furniture. If you have any issues with the size of the bed and the theme that you must chose, simply ask the representatives of the store, who would be happy to help you. All you have to do is make sure that you go to the best furniture store in your locality.